EVERYTHING when so smoothly…….. Wonderful that we could slip into the caves and a pure Delight for me to visit the Chillida Foundation. Great opera seat, and the olives and wine spiced and mellowed each meal. Many new surprises when Revisiting old haunts. The Guides were all top notch and very personable. I just wanted to email you and say thank you soooo much for all the help with the Honeymoon. It was absolutely perfect. We both fell in love with Portugal and Spain, such wonderful places. We can’t thank you enough. Plane back home from our fabulous trip in Spain. Please know that we were singing your praises all week. The lead up to the B&R trip was truly terrific, loved every minute. Thanks again for making me look good, ladies. Really appreciate it so much! I wanted to thank you for arranging a great trip for us! Everything went perfectly! We loved all of the hotels and restaurants. The trip to Biarritz was great. Our trip to Spain has been incredible thanks to you! The highlight of the trip was the 6 guides you arranged for us! All of them were superb! Their depth of knowledge, engagement, candor, humor, and patience with us was extraordinary. Thank you! You are remarkable! You go the “extra mile” and I trust you! I have worked with other Virtuoso partners in the past that have not taken the extra steps that you have. Experiencing customer service with you and your being pro-active makes me just so impressed. I will recommend you whole heartedly! We LOVED Spain and had a totally terrific trip because of your excellence. Thank you for great guides and great memories!! Our time in Barcelona was PERFECT. Not only will I recommend this for all my clients, I will now recommend longer stays. They had a WONDERFUL time! Loved everything. Enjoyed the driver and the vineyards. Enjoyed San Sebastian very much. Great trip! We had a wonderful time in Spain and wish we had allowed more time particularly in the south and Barcelona. Thank you for all the planning, I will certainly recommend Valesa to anyone needing a company in Spain. Fred and I had a fabulous time in Spain and Portugal. Your guidance and all of the arrangements you provided enabled us to maximize our time, focus our energy AND relax – a remarkable feat! The people who met us for transfers in each city were prompt, well informed, and generous. We felt entirely spoiled. The trip was terrific in all respects! El Nino provided surprisingly warm and sunny weather — in the 60s — which made the LA folks feel more comfortable than they anticipated. Thanks for organizing everything. The trip was a total success! We had perhaps one of our best vacations ever, thanks to you. It is such a pleasure working with you all. I really appreciate the constant help you are giving me and you now have a fan for life in Spain and Portugal. Thanks Laura! 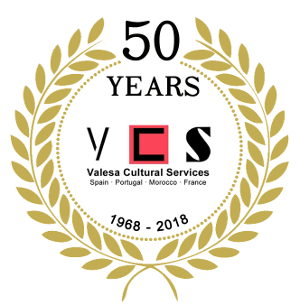 I will be happy to endorse Valesa Cultural anytime. Heartfelt thanks to you for every guide and driver and the most memorable Hotels. THANK YOU from the bottom of my heart for arranging such an amazing experience for me throughout Spain! Thanks again for arranging & sharing an amazing family trip! The time spent arranging all the attractions did not go unnoticed and was GREATLY appreciated. A HUGE BIG THANK YOU to you & your gorgeous guides! It has been my sincere pleasure working with you too. I now know exactly where I’ll send any and all future clients heading toward your corner of the world!! My client just called, RAVING about the trip. They loved the resort in Portugal, and said Portugal was a hidden gem. Thank you for making me look so good!! Your professionalism in handling this unfortunate incident only adds to our appreciation and admiration for making our trip so effortless. If Michelin gave 3 stars for travel services your team would be on the list! Thank you! They LOVED everything and can’t wait to return to Spain. It was unbelievable, and I found myself so thankful throughout the two weeks at how well-organized and professional everything was handled. Everything was so well organized in the travel packet we received, and we appreciated the follow-up phone calls checking in on us while we were there. I so appreciate, as always, working with you to create special experiences for my clients in Spain. You are the best! We can’t thank you enough for helping put together such a wonderful trip for our family. The hotels were terrific, the guides were outstanding, and the transfers/drivers were wonderful! I’m so thrilled we found you and will definitely recommend you to others heading that way. Jennifer, I just can’t explain what a tremendous gift you gave us through the fabulous planning that you did. You leave no I undotted or uncrossed. Your attention to every detail helped my family have a fantastic trip. Thank you for all you do. Thank you for planning the Barcelona to Lisbon itinerary. On every level – accommodations, guides, restaurant reservations, taxis, tickets, and suggestions – VCS exceeded my expectations. Very happy to be a client of VCS. Thank you for making me look like a hero. The Hudgins are home from their trip and say their driver Josep is the best ever. …and these people are extremely well traveled and very fussy. I asked what made him so much better than others – and their reply was how he made the whole day so personal with human anecdotes rather than just facts. Thank you once again for a memorable and flawless experience. The hotel was a great choice. Valesa’s services were excellent and also flawless. They consistently met us on a timely basis and were flexible in accommodating some minor alterations in tour sequences. You and Valesa arranged an excellent trip for us in Portugal. All guides and drivers performed well with particular praise for Isabel, our Lisbon area guide, and Paulo, our driver in Porto and the Douro Valley. I just spoke to Jamie about their holiday in Spain. She has sung your praises about what a wonderful experience they had in Granada & Barcelona. The guides, especially Lourdes in Barcelona was exceptional. They loved the recommended restaurants & thoroughly enjoyed the Cava tasting excursion. Thank you for a fine job on behalf of my clients. Hi Marcy! Thank you again for a great job with the Kunkes! They said their guide Isabelle in Lisbon was INCREDIBLE! They had previously said their guide in Barcelona was wonderful too. They said the Hotel Arts was their favorite hotel EVER. I had such a good time! The trip was everything I wanted plus more!!! Consuelo was the best guide ever in my life. Elena was very nice also. Thank you for making this most important trip for me perfect!!!!! We appreciate that you care that each aspect of trips that you create go as flawlessly as possible, which is why Becky Lamb Travel will continue to partner with you for our clients heading to Portugal. This is just perfect, Jessica! I wanted to thank you for being so quick to respond and helpful in staying in the client’s budget – I’m super impressed by my first time working with you and Valesa and will be sharing that with the rest of my colleagues in our meeting this morning!